President Trump’s fiscal year 2018 budget requests a 10 percent increase for the National Nuclear Security Administration’s Research, Development, Test, and Evaluation program. 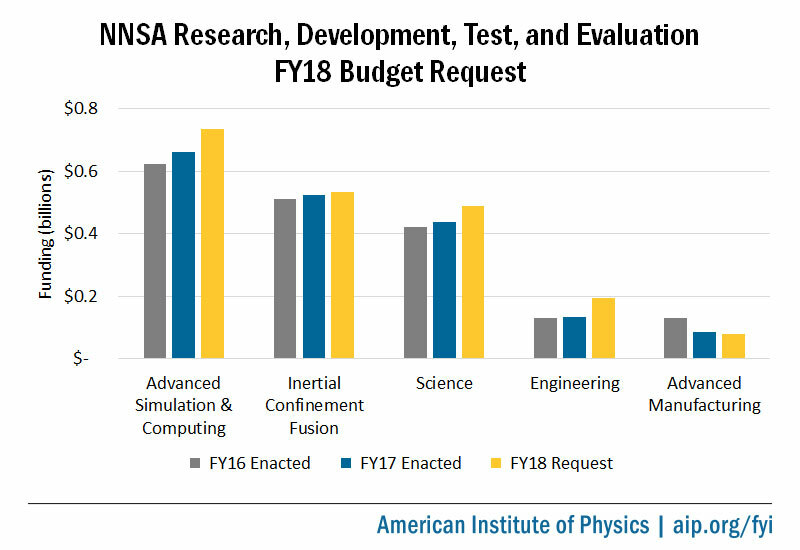 Much of the new funding would go toward accelerating development of an exascale computing platform, enhancing the subcritical nuclear testing program, and launching the Stockpile Responsiveness Program. President Trump’s fiscal year 2018 budget requests a $1 billion overall boost for the National Nuclear Security Administration, a 7.7 percent increase over the $12.9 billion funding level Congress enacted for fiscal year 2017. NNSA is the sub-agency of the Department of Energy responsible for maintaining the nation’s nuclear warhead stockpile. The increase is part of Trump’s proposed military buildup. 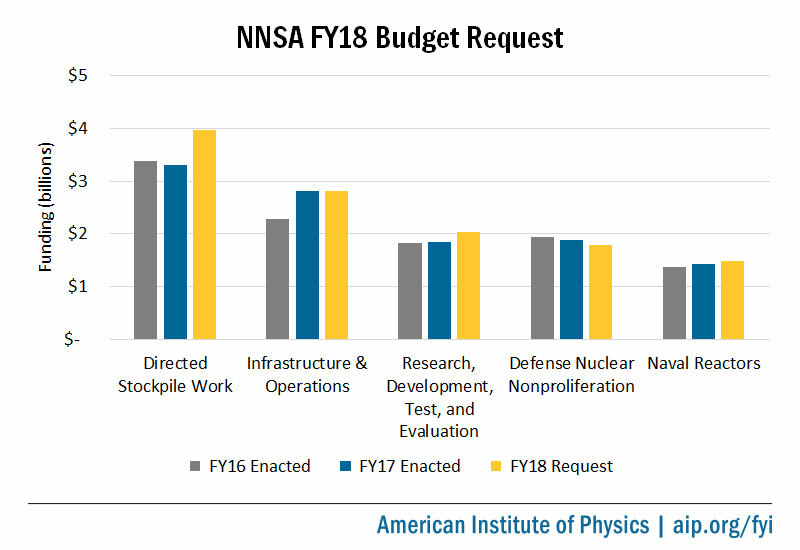 [The FY18 budget request] accounts for the significant tempo of operations at NNSA, which in many ways has reached a level unseen since the Cold War. It includes long overdue investments to repair and replace infrastructure at our national laboratories and production plants, and it provides modern and more efficient workspace for a highly talented scientific, engineering, and professional workforce. The charts below summarize the proposed changes for several topline accounts as well as the Research, Development, Test, and Evaluation (RDT&E) subaccounts. Figures for additional accounts are available in FYI’s Federal Science Budget Tracker, and NNSA’s budget request document is available here. The budget request matches the overall funding level that Congress provided for the Infrastructure and Operations account in fiscal year 2017, again placing a high priority on addressing a backlog of deferred facility repair and recapitalization. Much of the overall funding increase would flow to the Directed Stockpile Work account, which includes activities such as the LEPs and production of uranium, plutonium, and tritium. The RDT&E program would also benefit, rising 10 percent above the fiscal year 2017 enacted level to just over $2 billion. Funding for Defense Nuclear Nonproliferation would fall to about $100 million below the currently enacted amount. Klotz testified that the decrease is primarily due to the proposed termination of the in-construction Mixed Oxide (MOX) Fuel Fabrication plutonium reprocessing facility located in South Carolina. The Obama administration also proposed shuttering the facility in favor of a cheaper, dilution-based approach to disposing of plutonium from dismantled warheads but was ultimately rebuffed by Congress. Exascale computing: Requests $183 million for NNSA’s contribution to the joint Office of Science-NNSA exascale computing initiative, with the goal of fielding at least one exascale system in the early 2020s. The Office of Science budget requests a large increase for its portion of the project as well, bringing DOE’s total funding for the effort up to $508 million, which is over $200 million more than the amount enacted for fiscal year 2017. Fusion facilities: Provides $326 million for the National Ignition Facility at Lawrence Livermore National Lab, $111 million for the Z Facility at Sandia National Lab, and $67 million for the Omega Laser Facility at the University of Rochester. NNSA requested $330 million, $92 million, and $64 million for these three facilities, respectively, last year. 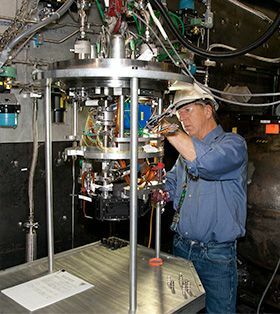 Academic use of NIF: Reserves approximately 8 percent of the National Ignition Facility’s usage time for “partnering with academic institutions to carry out science of mutual benefit to the NNSA,” the same amount as was reserved last year. Enhanced Capabilities for Subcritical Experiments (ECSE): Requests $51 million for a new subprogram that will support construction of an underground laboratory at the Nevada National Security Site (NNSS) and new equipment for conducing subcritical experiments. As part of its justification for the effort, the document cites a JASON defense advisory group review of the ECSE program that NNSA commissioned at the request of Congress. Subcritical experiment rate: Requests a $16 million increase over the fiscal year 2017 enacted level for the Dynamic Materials Properties program in part to support a ramp up toward conducting two subcritical experiments per year at the NNSS. Radiation-hardened microelectronics: The increase to Nuclear Survivability would also support initial design work on a replacement for Sandia National Lab’s Microsystems and Engineering Sciences Applications (MESA) Silicon Fabrication Facility. Plutonium pit production: Requests $181 million for the Chemistry and Metallurgy Research Building Replacement Project, a 20 percent increase over the fiscal year 2017 enacted amount, to keep the agency on track to achieve a production capacity of 30 plutonium pits per year by 2026, as required by the fiscal year 2015 National Defense Authorization Act.